Competitor Games • View topic - [3.5 PrC] Are you afraid of the dark? [3.5 PrC] Are you afraid of the dark? Children hide under their blankets at night, fearing what lurks under their bed or behind a door. Farmers stare worriedly into the night from the safety of their porches, wondering what horrors lurk beyond the warm glow of their fires. Daring adventurers peer into the depths, hoping their torches will pierce the blackness and reveal what is hidden. Emissaries of the dark embrace the depths and shadows, revealing in the fear it causes in others. They believe the darkness itself is a thing to be respected and feared, and not just the things that it hides. Warlocks that follow this path bring the darkness where ever they go, shadows clinging to their heels, light seeming to retreat from their presence. Feeding and bolstering the darkness they worship, they eventually become one with it, merging with the night. Class Skills: Bluff (Cha), Concentration (Con), Craft (Int), Disguise (Cha), Hide (Dex), Intimidate (Cha), Knowledge (arcana) (Int), Knowledge (the planes) (Int), Knowledge (religion) (Int), Move Silently (Dex), Profession (Wis), Sense Motive (Wis), Spellcraft (Int), and Use Magic Device (Cha). An emissary of the dark gains no new weapon or armor proficiencies. Your emissary of the dark levels stack with your warlock levels to determine the the grades of invocations you can learn. At each level other than 1st and 5th, you gain new spells per day and an increase in caster level (and spells known, if applicable) as if you had also attained a level in an arcane spellcasting class to which you belonged before adding the prestige class level. You do not, however, gain any other benefit a character of that class would have gained. If you had more than one arcane spellcasting class before becoming an emissary of the dark, you must decide to which class to add each level for the purpose of determining spells per day, caster level, and spells known. Your darkness invocation is fundamentally changed. The darkness you summon forms tentacles that wrap and cling to any enemies within the area of the invocation. As a standard action you can channel your eldritch blast through your [/i]darkness[/i] invocation, affecting any creature within the radius of the invocation. If they succeed on a Will save with a DC equal to 10 + your class level + your Charisma modifier they take half damage. An eldritch blast channeled this way cannot have any eldritch essence or blast shape applied to it. You may target each die of damage your eldeitch blast deals individually. For example, if your eldritch blast deals 3d6 damage, you may target a single creature with 3d6 damage, two creatures (one with 1d6 and the other with 2d6), or you may target three creatures with 1d6 each. At 2nd level, when an emissary of the dark calls forth the clinging shadows he is known for, they are shaped by the unique personalities of their summoner. At each level of emissary of the dark after the first, you may select an option from the following list. Whenever you channel your eldritch blast through your darkness invocation targets suffer the chosen effects. If the effect mentions a DC it is equal to the DC of your hungering dark. Deranged Whispers: Inaudible whispers talk of forgotten nightmares to the creatures within your reach, scratching away at their sanity. Creatures that fail their save are confused for 1 round.You must be 5th level to select this option. Distracting Embrace: The tentacles of night that wrap around your foes writhe and dance, making complicated efforts difficult to focus on. As long they remain within the darkness, creatures damaged must make a concentration check to cast any spells with a DC equal to your hungering dark DC + the spell’s level. Echoes in the Dark: Your arcane power resonates within the darkness, hurting those that have been touched. Creatures damaged suffer additional damage equal to half the damage taken at the beginning of their next turn. Entrapping Night: Darkness pulls at those damaged by your power, preventing them from escaping your reach. Creatures damaged are entangled for 1 round. Foul Touch: The feeling of crawling darkness makes even the most disgusting creatures want to scrub their skin clean. Creatures damaged are sickened for 1 round. Fright of the Exposed: You strip away the protections of your enemies, leaving them naked to the ravages of the world. The damage reduction of any creature that fails their save is suppressed for 1 round. 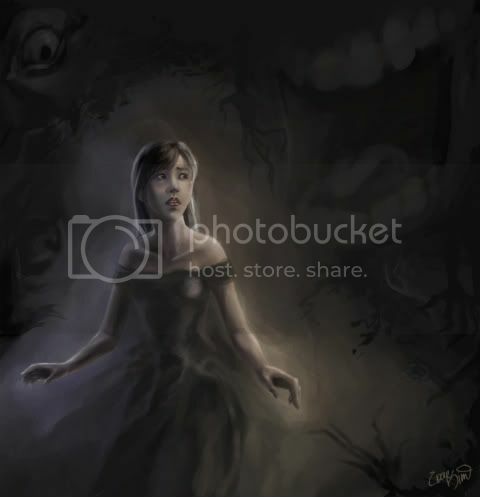 Imagined Fears: Your darkness evokes the primal fear of imagined threats just outside the senses. Creatures damaged are shaken for 1 round. Lasting Twilight: Light is banished from eyes touched by your darkness. Creatures that fail their save are blinded for 1 round. Noxious Gloom: Your darkness emits vile fumes that upset the stomach. Creatures that fail their save are nauseated for 1 round. You must be 3rd level or higher to select this option. Poisonous Depths: The darkness you create contains a natural poison that seeps in through the skin. Creatures damaged are exposed to a contact poison that deals 1d4 Strength initial and secondary damage (Fortitude DC equal to the DC of Hungering Dark). Creatures that make their save against this poison become immune to it for 24 hours. Stifling Dimness: Any power aside from your own is hindered by the drakness you control. Creatures damaged gain a -3 penalty to their caster level and manifester level for 1 round. Unstoppable Hunger: The defenses that hold your darkness at bay is eaten away, allowing it to continue to feast. The spell resistance of any creature that fails their save is suppressed for 1 round. Window to Shadow: The black that you summon comes from the dark negative plane, sucking light and life into itself. Creatures that fail their save gain 1 negative level. This negative level dissipates after 1 hour. You must be 5th level to select this option. At 2nd level, your darkness invocation becomes more potent. You add your emissary of the dark levels to the spell level of the darkness you create, increase the spell level of the darkness (like if you applied the Heighten Spell feat). In addition, you gain a bonus on rolls to overcome spell resistance equal to twice your class level when you channel your eldritch blast through your darkness invocation. At 3rd level, you wear the darkness like a cloak, concealing you from your enemies. The miss chance granted to you by the concealment of your darkness invocation increases by 10% per class level. At 4th level, your connection with the darkness allows you to extend your sense, feeling whatever is hidden in your dark shadows. You gain the effect of touchsight, but only within the area of your darkness invocation. Once an emissary of the dark reaches 5th level, the darkness they may call upon is an inky blackness that conceal everything, and even magical creatures had difficulty seeing through. The darkness invocation now obscures all sight beyond 10 feet. A creature within 10 feet has concealment, while creatures farther away have total concealment (50% miss chance, and the attacker can’t use sight to locate the target). Creatures that can see through magical darkness (by having the See in Darkness ability, True Seeing, etc.) can see creatures within 10 feet without issue, but creatures farther away have concealment. Your movement speed increases by 20 feet. The DC of your Hungering Dark ability is increased by 2. When you channel your eldritch blast through your darkness you heal half the hit point damage dealt. You cannot move into an area of less than shadowy illumination. Any darkness you occupy cannot be dispelled as long as you are in it. Spells and abilities with the [Light] descriptor deal 50% more damage to you. All your worn of carried items and equipment become nonfunctional, absorbed into your new form. You may remain in this form for up to 5 minutes per day, divided as you choose. You may end this ability as a swift action. Anyone who is drawn to becoming an emissary of the dark will naturally have a fascination with darkness and the lack of light. Fear and mystery are common, so intimidation and other fear-based tactics are often found with characters following this path. In the night and other dark places they can make for incredible scouts or guards. Combat: Emissaries never want to get into melee combat, and often enjoy sneaking up on enemies and causing confusion by laying down an assortment of penalties on entire groups of people. They make solid battlefield controllers or debuffers, depending on what abilities they select. They can dish out some pain, but that is usually secondary to the various effects that combine with how hard it is to land an effective hit on one. Lasying down several areas of darkness to cover the battlefield and hide in is a favorite tactics. Advancement: Emissaries will often continue in the warlock class, honing their innate abilities. Taking other dark or fear-themed PrCs is also a relatively common option. Some use the cover of night for more nefarious activities, and practice skills of thievery and stealth, augmenting their already impressive connection with darkness. Resources: There a many beasts and demons that make their home in the night and dark places of the world. Emissaries of the dark can often find a common ground or affinity with these creatures. More evil-leaning societies may employ them as guards or policemen for the twilight hours, using their abilities to the fullest. "The moon and stars illuminate the night casting beautiful shadows with their silvery light. These emissaries want to plunge the entire world into the depths of the Underdark and make us all live like our vile cousins. I’ll never understand them." There are very few places in the world where the night is not feared at least somewhat. Emissaries of the dark can be found in every region, a part of every race. Some may worship the blackness, while others may simply be trying to exert control over something they still fear themselves. Daily Life: Emissaries prefer to sleep through the daylight hours if they can. Their powers work the best at night, and they find the encompassing darkness a comfort. They can often be quite personable, and enjoy talking and meeting new people. It isn’t uncommon to find one arriving at a tavern as morning breaks, sleeping through the day, and then joining patrons for the dinner meal, mingling and laughing, enjoying the sight of the darkening sky outside as most enjoy the sunrise. Organizations: There is only one small cabal for emissaries of the dark, though it’s tendrils spread far. They have taken their worship of the darkness to a new level, believing it to be an entity in and of itself. They welcome all emissaries, including those that don’t believe in the dark to the extreme that the cult does (members believe that all will eventually come to realize the desires of the dark through prolonged familiarity. Binder scholars believe that this is a splinter sect that originally worshipped Orthos, Sovereign of the Howling Dark, and the several members have admitted the similarity and possibility. Most people wouldn’t be able to tell an emissary of the dark on the rare chance they met one. They would likely find the emissary pale, and think they kept odd hours, but think nothing more of it. Those that would recognize a warlock rarely can tell the specialization of an emissary, nor will they care, treating them just the same as any other warlock. Binders and shadowcasters feel some affinity for emissaries, and will often be more receptive and understanding of their interests. You shine as a battlefield controller, being able to hand out some respectable penalties and effects to a number of opponents. You’ll want to focus on your charisma, keeping your save DCs high, and stay out of melee combat. Its good if your allies have some way to detect creatures other than sight, so they can take advantage of the concealment your darkness offers. At higher levels you make an impressive scout, nearly undetectable in the darkness. Adaptation: Emissaries of the dark can find their way into any setting where warlocks can be found. The darkness is universal, and those that fear it, or desire to harness it’s power, can be found in every world. Encounters: If your players happen across a sociable emissary they may leave company with some interesting information and a new contact in the world. Solitary emissaries tend to prefer their privacy, and deal quite harshly with those that disturb their peace. Last edited by MammonAzrael on Mon Mar 07, 2011 2:34 am, edited 7 times in total. Re: [3.5 PrC] Are you afraid of the dark? Not bad. A few comments. Firstly, it seems a little odd that this class has no features that would allow it to actually SEE in darkness. It's entirely conceivable for an Emmisary to be blinded by his own Darkness invocation. Maybe instead of the Blind Fight feat prerequisite, require the Devil's Sight invocation, which would mostly take care of that? Perhaps include a class feature at some point that extends Devil's Sight magical darkness sight further than 30'. Also, this class makes no mention of the Hungry Darkness lesser invocation. I think these class features should work with that as well. Your darkness invocation is fundamentally changed. The darkness you summon forms tentacles that wrap and cling to any enemies within the area of the invocation. As a standard action you can channel your eldritch blast through your [/i]darkness[/i] invocation, affecting any creature within the radius of the invocation. If they succeed on a Will save with a DC equal to 10 + your class level + your Charisma modifier they take half damage. An eldritch blast channeled this way cannot have any eldritch essence or blast shape applied to it. Each die of damage may affect a different target. This is fine up until that last sentence. I'm not entirely sure what that's supposed to mean. Are you talking about dividing the d6's of your blast among each target? So you have an eldritch blast of 3d6, you can hit one target for 3d6, or one for 2d6 and another for 1d6, or three for 1d6? If that's what you meant, some clarification is needed (an example is great for this sort of thing). If not, well, clarification is still needed because I'm not sure what you're getting at here. Creatures damaged are exposed to a contact poison that deals 1d4 Strength initial and secondary damage (Fortitude DC equal to the DC of Hungering Dark). Multiple exposures to this poison do not stack. I'm not sure what you mean by multiple poisons not stacking. If you don't want to be able to do this strength damage over and over again, I would suggest making it either a strength penalty, or adding a cooldown period to this particular Gloom effect. Perhaps add a clause about a victim being immune for 24 hours after one exposure? I suspect something was lost in translation here. I presume the DC is equal to that of Hungering Darkness here? Overall, cool stuff. I'd let a player take this if they wished. Proven Paradox wrote: Not bad. A few comments. Oooh, I like it. Done. I thought about it, but then you'd be gaining a notable amount of extra stuff from the swarms, as well as making some choices from Ravenous Gloom effectively irrelevant. There would be almost no conceivable reason to not take Hungry Darkness. That is exactly what it means. I'll add clarification. I wanted their to be an option for a poison, as I felt that it was such a flavorful fit, but I thought that 1d4 ability damage every round like that was just too strong. And I've wondered if the current incarnation is too weak. I like the immunity idea, though I think I'll need to up the damage a little if I go with that option. Haha, yeah, a remainder from brainstorming ideas that I didn't notice. Thanks! The idea was originally spawned from Lord_Gareth's Umbral Celebrant. EDIT: Updated! I also added some more flavor tor Ravenous Gloom.